Is Sleep Deprivation Holding You Back In Life? If the answer is yes, as it is for many people, then the next practical question is: What's the best way to END your sleep deprivation so you can live your life at its fullest alertness potential? We think the answer starts with knowledge. Our philosophy is that by learning a bit of the science behind how sleep and alertness work in your body, you can begin to make strategic sleep and alertness decisions that will have BIG impacts on how you feel during the day and night. 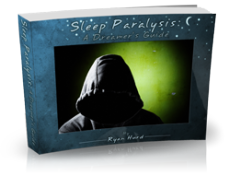 At EYSD we aim to make sleep science fun and accessible. We leave the technical academic speak at home and focus instead on practical communication, whether that be through engaging articles, interviews, videos, images, stories, or games. Most of the content on this site is created by energetic students in a class known for having a little bit of fun--Dr. Dement's Stanford Sleep and Dreams, where falling asleep in class gets you extra credit (really, it's not an urban legend), but only after you've been woken up by a squirt gun and yelled the class mantra, "Drowsiness is red alert!!" The result is a blend of entertaining and accessible information that we hope will help you to feel empowered to take command of your sleep and alertness. 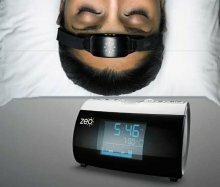 Ready to get started with your sleep education? There's a lot to be lost or gained depending on your sleep health. Not only is one-third of our lives occupied by sleep, but the other two-thirds are largely dependent on it. But we don't always think of sleep as such a cornerstone to our healthy existence. Why is that? Let's put some perspective on the place sleep has in society by looking at the cornerstones most of us do recognize at once. Nearly everyone knows that good nutrition and regular exercise are key ingredients to a healthy, happy life. We get the importance of each hammered into us from a very young age, typically from both school and home. The triumvirate of health calls for eating well, exercising enough, and sleeping right. 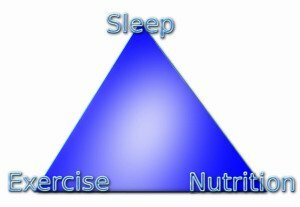 People tend to have a great understanding of the first two, but healthy sleep knowledge is lacking. However, nutrition and exercise are not the only foundational elements of well-being. Without healthy sleep, an aspect much less thought about on anything beyond a basic level, overall health is utterly compromised as good nutrition and exercise are much harder to achieve in a meaningful way. And thus sleep, as a third element, completes the triumvirate of health. The triumvirate of health is the ultimate lifetime philosophy of well-being. A person who behaves according to its three principles--good nutrition, physical fitness, and healthy sleep--is well on their way to optimized health, energy, and longevity. Unfortunately though, knowledge about sleep is not very widespread in society, and few people really know how to react when their sleep health runs into problems. But this is not due to the fact that the information to deal with sleep problems is unknown. A great deal of knowledge about sleep mechanisms, sleep deprivation, and sleep disorders has been accumulated in the last handful of decades, but the general public remains largely in the dark about it. It will be extremely important for newly aware individuals to be proactive in promoting healthy sleep not only with regard to themselves and their friends, but in their community as well. There's a substantial education gap between sleep scientists and society. But it does not have to be that way for you personally. You can take charge of your knowledge and be strategic about your sleep health, just like you can be strategic about your nutrition and exercise. Apparently, saying the gap in knowledge is substantial is a huge understatement. The gap created by the absence of adequate sleep education is causing problems in all components of our society. When a sleep deprived individual falls asleep while driving and is rendered dead or disabled for life, it is rare that anyone fully realizes that such tragic events are preventable on a very basic level. When a 50-year-old executive dies of coronary thrombosis, no one realizes that an undiagnosed sleep disorder may have been the culprit. The educational activities that could begin to reduce and eventually eliminate such tragedies have not yet permeated our society. The formal educational structures may not be fully in place yet, but that is even more testament to the importance of a quality resource to learn about practical sleep knowledge, and that is exactly what we hope to offer you here. So dig in to our material, wave goodbye to your sleep deprivation, and say hello to a healthier and livelier you. Take the next steps towards ending your sleep deprivation by reading the brief but useful Sleep Essentials Mini Guide--short articles that get straight to the important stuff you'll want to know before digging deeper. Read more about the EYSD philosophy here. Let's face it, Facebook is a website that makes sleep deprivation that much easier. Ever browse it late at night? Well now you can at least turn Facebook into a tool that gives you more resources to ameliorate your sleep deprivation. Just "Like" End Your Sleep Deprivation's Page below and you'll be able to chat on our Wall and get some of our best new material occasionally in your News Feed. Curious about the Effects of Sleep Deprivation? A great sleep starts with a great mattress, check out The Dozy Owl's Memory foam mattress recommendations for help finding the right one. A well-designed and comfortable mattress can help get rid of sleep problems. Browse reviews from experts to learn more details.